Ford Motor Co. is using virtual reality to keep its workers safe and assist them on nearly every part of the car-building process. The Dearborn automaker on Thursday invited media for a first-look inside its new Ergonomics and Variation Analysis Lab, a 1,800-square-foot facility that opened in January and serves as a testing hub for everything from attaching transmissions to engines to connecting hoses and pushing in headlamps. Using virtual reality demos, Ford has been able to streamline the manufacturing process and make it safer, resulting in a 70 percent drop in worker injury rate and 90 percent drop in ergonomic issues like overextended movements and difficult hand clearance. The ergonomics lab — the only Ford facility of its kind — includes a small team of about three employees, but it constantly brings in product specialists from across Ford’s lineup to look at building vehicles safer and easier. Ford’s been using some form of virtual reality testing for ten years and has applied it to 100 vehicle launch programs like the 2015 Mustang and 2016 Explorer. But today’s technology is much more advanced than what the automaker used to work with. The ergonomics team uses virtual reality to simulate the build process about 2-3 years before a product hits the showroom. One process used is called full-body motion capture, where the automaker uses data on how an employee moves around their work station at the plant to complete certain tasks. 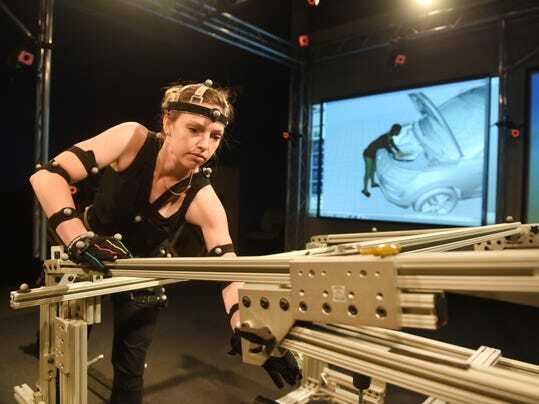 They use 52 motion-capturing sensors and 23 cameras to track body movement and muscle strength for pushing, pulling and connecting car parts. It’s the same technology used by professional athletes to simulate a golf swing or tennis serve. Ford puts the motion-capture into a highly-detailed 360-degree virtual reality plant, and includes details like how lights and shadows affect certain vehicle parts. In a demo Thursday, Ford showed how it used the technology to streamline the process of attaching a transmission to the engine of its 2015 F-150 pickup. Jae Perry, a product specialist at the Dearborn Truck Plant, said the technology helped reduce the time it takes to fix parts or processes from weeks to hours. The automaker also uses 3D printing to help its ergonomists decide if an employee’s hands will be able to fit in certain places to connect hoses or other vehicle parts. It can even print models with some parts that are flexible and some that are rigid to help better simulate real parts on a car.